Try to do this all in one sitting. The autosave in this game is AWFUL, unless you're specifically choosing “Quit Game” before closing out. If you're missing something, look at your required inventory pictures – if there's still one of those items to find on the screen you're on, it will be blue. If not, it will be grey. You might still not be able to get to the item at that point, but at least you'll know what screen they're on. Nothing is missable - there's chapter select once you finish the game. However, I recommend a few places to quit to the main menu just to trigger the autosave so you can do everything without using chapter select, and I recommend you do the same. Yellow is good to go. Don't touch it. Move blue loop up, all the way left, down x2, right, down. Plug should be in the purple outlet. Put together the puzzle – it's of a pair of lips drinking from a straw. Put the lips together in the middle rows of the first two rows and you'll easily figure out the rest. Look at the instruction picture. All the items you need to find are hilighted in blue and they're all in this scene. There's no penalty for misclicking or anything, so just click around until you pick something up and place it on one of the machines – you can't mess this up. Most of the items are in the background. Pick up butterfly – Color Separator (S) unlocked. You now have all butterflies. Starting from the top middle (1) and working around clockwise 1-6, rotate 2 x2, 3 x2, 5 x1 and 6 x1. Turn the all of the color valves EXCEPT FOR RED. I recommend just moving from purple up to orange. Wait for the water to stop before turning the next valve. Work your way outside in, fine-tuning where necessary. Just worry about lining all the hearts up with each other and ignore everything else. It's pretty generous about the automatic alignment kicking in. Solve the puzzle – green spiders go on outer ring, blue in middle, red in center. Work from the inside out – get the red spiders done first, then work on blue and green, as getting those two situated does not involve touching the red spiders at all. On the table in front of the doctor is a lever. Pick it up, put it in the machine your sister was previously blocking, and pull the left lever, then pull the right one to pick up the pipe piece. pipe pieces. If you miss, just try again until you get it. Connect the three blue pipes to each other and the shower head on the top left. Purple goes in the bottom-left. Red goes bottom right. You should be able to fill in the rest. This is just like the Snail House from Chapter 1. Click around until you find something, then put it where the diagram indicates. 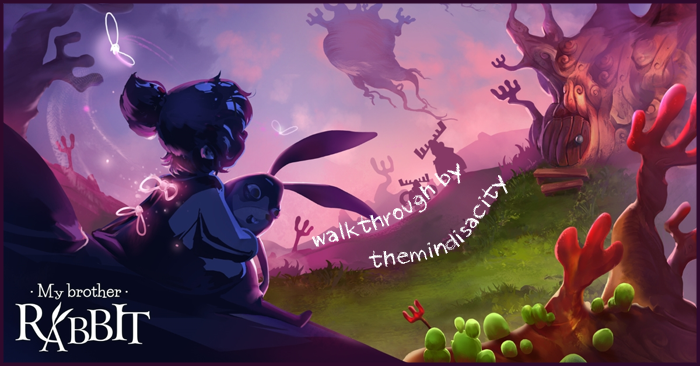 It would take longer for you to read a walkthrough of it than it would for you to just click around. Look at lizard face – you need to get CDs. On the left side, put 4 and 5. On the right side, put 5 and 6. Pick up gear. Click on the small curtain on the right side of the house, pick up the knife, and cut open the purple bag. Rotate the maze so the balls fall in the heart. Once they're there, they're stuck, so just focus on one at a time. Starting from the bottom right, just always click the option that's closest to the border, and click until you get the option to either click on a second row square or the center square. Click the center square. Then click the square under that, and the rest should just be default clicks. Pick up the left item (scissors or a feather) and use it on the moose on the tracks, then click the moose to send it outside. After the cutscene, click the moose to send it inside. Repeat this process with the right item (scissors or a feather). You can startle one of the signal birds here if you want, but the other can't be moved yet. Put a big gear next to the lower left gear so it starts turning. Same type of puzzle as before. Find the items and place them where the diagram indicates. The right drawer has a key that opens the chest on the left, for one of the pieces. The walnut under the drawer needs to be put on the red table and cracked open first. Just above the hatch door is a cork. Pick it up and put it in the top-most of the three yellow plants left of Rabbit. Pick up the purple bottle crab thing and place it in the bottom left corner of the screen – this will raise a feather to pick up. Now just work your way clockwise, matching the colors. Just above where you've placed the shells is a panel. Pick it up and put it in the broken track on the right. Look at the leaf with the turtle on it left of the ladder. You need to find turtles. Left of this turtle leaf is a panel. Pick it up and put it in the broken track on the right. I recommend you quit the game here (press start – quit game) to make an autosave before this puzzle. 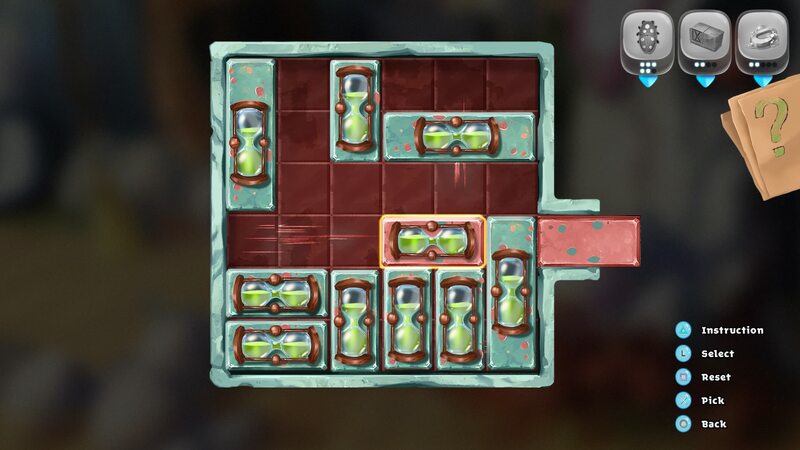 The previous autosave is quite a ways back, and this is an easy puzzle to mess up – there's no reset button on this one. Wait for a blue fish with a key nose to appear. In the bottom left corner are two black clams. One is empty and the other has a disc – you now have all discs – make sure you open both of them - Shell Inspector (B) unlocked - sometimes this doesn’t pop until you open a different clam a bit later, when you’re searching for pearls. I don’t know why. Swap the discs around to complete the picture. Pretty easy. Don't focus so much on the eyes as on the background. On the pipe, move the pieces so that the square is in the middle of its rows, the triangle in the middle of its rows, the star on the top of its rows and the circle on the top of its rows. We'll come back to this item. Click around to find and replace all five teeth in the skull. Quit the game to make an autosave/backup save. 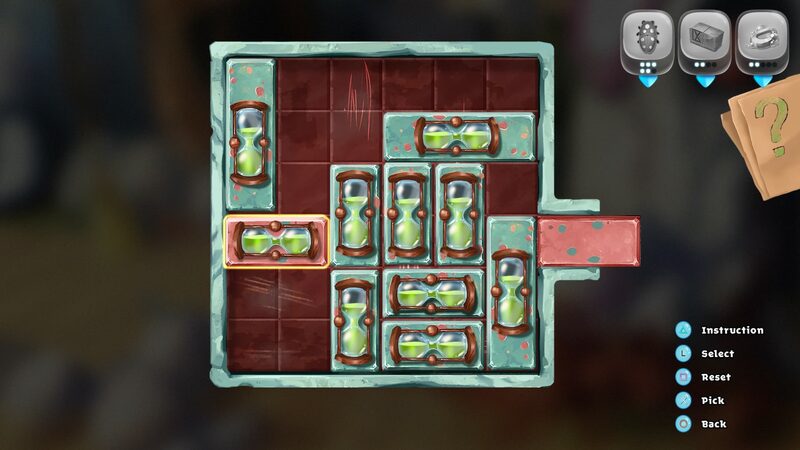 There's a timed one-shot trophy coming up after this puzzle. Pick up the paper airplane on the hatch you just dug up and put it in the triangle slot. This is an annoying timing puzzle. You need to click on the puffball dude so he lands on the paper airplane and brings it down to the next level. Repeat two more times, but your timing is going to change with each level, because the puffball has further to fall each time. Also, if you miss, it resets to the top level. This is basically dominos. Rotate with Square if needed. Put 5-blank in the top left corner (5 on left), 3-6 in the top right (6 on left), 1-1 in the bottom right, and 5-6 in the bottom left (6 on left). Fill in from there. Open the hatch on the red clock, pick up the dagger, and use it to cut the vines in the bottom left (the hotspot is in front of the chest). You have done this before, but this time match things where they make sense (ex: rabbit in a top hat, kite on strings, etc). You click between three screens to finish the puzzle – screens controlled by the clock hand. First screen: The battery (stove) goes in the rocket ship. Place the shovel, car wheel, kite, pinwheel, and piece of cheese. Third screen: Carrot goes in the mushroom on the left, which gets you the rabbit. Inflate the soccer ball with the pump on the right. Place the soccer ball, circle (in mushroom on left), ball on string (on the bouncy duck-horse neck), pirate hat, and rabbit. Sickness is Gone (G) and Super Explorer (P) unlocked during ending cutscenes. Guide is complete. Hope it helps! The shell inspector trophy doesn’t actually pop until you collect the pearl from the yellow oyster shell underwater next to the sub. Really? I tested my walkthrough just as it was written and it popped where I said it did. That's weird. I wonder if it's a version difference?